AnonD-24171, 27 Jan 2013Keep fooling yourself since your way of speak shows how shallow you are. 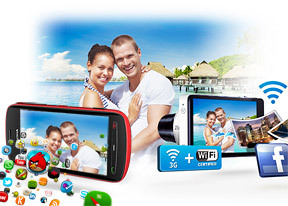 Samsung Galaxy Camer... more:))). What a waste of words and energy!!! First, learn to be nice me dear fandroid. Second, Sony has made this type of technology? :)))) When? Five years from now? Ja, i've heard that Samsung and Sony had 12mpx camera phones before Nokia. But no one knows them. I also heard that Samsung are the best in photography. But no one noticed that (but only the fandungdroids). In fact, in all reviews you can see Samsung taking a buttnaked beat from Nokia, and that is why it makes Samsung the victor;). Now, you come here and brag about Samsung making it's own sensor? Who cares? Samsung makes from wash machines to toilet seats, take a look at some ex: Samsung Toilet Seat SBD-935 EMS. Or this interesting... thing...: Samsung T700. Or this new "innovation"... this best toilet in the world. It's a toilet seat with some live crap effect's on it's protective plastic while flushes the toilet. Is that gonna make it better? They are all over man, and will never be the best. In PC world, they are on 6'th place. And here i'm being gentle cause their ram stink, their Burners stink, their harddrives stink. In mobile world, is the same, their products stink, If their wasn't no app in that droid store. What would have been the use of any dung product?:)). In every market they play on, there is someone better. You know why? Cause a multibusiness will never give them the chance to be the best, and let's not forget: Cause they stink! Third: Nokia is designing their products and their cameras and everything in their devices is their innovation. And their innovation and quality is better then Samsung's... FOR SHORE! They, make them on paper and they decide the build, the material, the quantity, the size, what chemicals should be used. And then, just give this to factorizes to make their products. So, that is why they are so good and Samsung is not. I don't see why i should have a factory to make sensors when i can plan them, invent them and innovate?! And give this patent to a trusted factory who will make this product only for me, cause i invented it. What is the point of making your own sensors?:))). To make a good camera doesn't mean to make your own sensor. Means to innovate, to do some mathematics, some physics, some chemistry and some software so your sensor will take good pictures. And that cannot be applied in Samsung's world. POINT. It is useless what you say man. Learn some technology and marketing before coming here with your multicrapbrand or keep it low, so to appear smarter;). The proof is right here. Nokia beat the crap out of GS camera. Everybody said it... GS camera is weaker! Only you see it better:))), i bet that s3 has a better camera then 808 right?:))). AnonD-24171, 27 Jan 2013Keep fooling yourself since your way of speak shows how shallow you are. Samsung Galaxy Camer... moreYou seem to have a very narrow viewpoint. Just because (almost) every part of the GSC is from Samsung doesn't mean that it is better than others who contract other companies. Sure, the GSC beats the 808 in terms of zooming capabilities, but nothing more. The 808 beats the GSC by a far margin when it comes to image quality. For me the GSC is a waste of money because look at what it boasts: automatic and instant upload to Facebook, Instagram, Twitter and other social networking sites. Why would we need a 16MP camera for those? Nokia said that the 808's 5MP mode is perfect for Facebook uploads, but honestly we don't need that much. A 2-3MP photo will suffice for most social networking sites. Besides, even when the 808 captures photos at full resolution, FB upload for photos is amazingly fast! I own an 808 and I am already very well familiar with this device. Carol, 22 Jan 2013Your sight is not good my friend, Take another look, The gs camera is a Big piece of s:8t in f... moreKeep fooling yourself since your way of speak shows how shallow you are. Samsung Galaxy Camera is pure Samsung technology even the sensor its first Samsung sensor and its good for first try while Nokia is nothing that a kid who takes every part from others and say its his. Nokia Sensor from Toshiba and Lens from Carl Zeiss so you better to shut up! and by the way Purefail technology is nothing than an old technology Sony and many brands came with it before Lame Nokia. When Nokia can build their own Camera or phone you can open your ugly mouth again. I'm not sure about Galaxy's camera success if the price is higher than most smartphones. Just for example, an Xperia T costs the same and the 808PV is just 100 dollars more. Big fan of android and Samsung, but android photo quality for Samsung has some short comings.Have Galaxy Ace and Note, excellent picture in good light, but below average in low light.Had a Samsung Marvel, colors where where more spot on,not over saturated as with Galaxy Note I. Android Photo Quality needs improvement compare to apple and nokia. Reading last lines of your article made me feel intense emotions. Carol, 22 Jan 2013Your sight is not good my friend, Take another look, The gs camera is a Big piece of s:8t in f... moreWell said my friend. Well said..
AnonD-61316, 24 Jan 2013i meant to say that if symbian could directly run android apps directly...by the way 90% apps ... moreHave you used an android phone? Games are MUCH BETTER THAN SYMBIAN.As I said,symbian os is quite old,and android is getting ultra fast updates.The jelly bean is no joke,mind you.And how did u think android isnt able to play them well? AND, NOKIA IS LAUNCHING A 38 mp phone ON WINDOWS.READ THE NEWS SECTION ON GSMARENA. You shouldve compare the rich recording vs samsung galaxy video sound in a club lets say.... I really want to see what is the result going to be! AnonD-61316, 23 Jan 2013isnt there any way by which symbian can run android apps...? blackberry and sailfish can run a... moreAndroid is a different ball game.The older versions of android phones when rooted and upgraded,dont work perfectly themselves.Symbian getting android apps is a far fetched dream.Because Symbian has a more simplified ecosystem & androids have a very high number of communities developing custom roms,roots,etc. isnt there any way by which symbian can run android apps...? blackberry and sailfish can run android apps..so why cant symbian. ?i know it is not linux based os and it will be pretty difficult to make symbian do that.,.but there should be some way..i mean there is alaways a way.. .
only if nokia can make a phone vid n8,s sensor and quality along with gud nibht shots, ois then its a win win situatio for nokia,, i dont know whh they are not doing it, its tough to put this gigantic sensor but if the lumia 920 body cud b near to n8,s body then why not take a chance, only symbian can handle the gigantic sensor , i guess its tough for windows phone as well.... Iam missing symbian alot, and to some extent meego as well.i dont care if the phone is muscular( i dont like anaeroxic sguff,,, cough s3 cough iphn),,like n8.. There actually should not be a comparison between these two as the represent two different families. Nokia 808 is a phone with some revolutionary camera options while Samsung galaxy camera(SGC) is a sort of semi-slr with internet sharing capabilities. As this article mentions, Nokia Pureview 808 is the best camera phone. Samsung galaxy camera has to be compared with either Sony HX100V or Nikon P500 or some equivalent Canon camera to actually understand whether is 21x optical zoom and picture quality is justified. Nokia 808 can be accommodated in your pockets whereas SGC has to be cannot be carried on the go. Hope Nokia brings 808 features to some Lumia.